A special thanks to Anapan who led me to this device. The SmartJoy Frag is available for the XBox and PS2. The PS2 SmartJoy Frag is an adaptor which allows ALL PS1 and PS2 games to work with a Mouse, Keyboard and Trakball. Both the Keyboard and Mouse or Trakball have to be plugged in for the adaptor to work properly. The keyboard is especially needed, even if you are playing a mouse only game. It is used to select presets or customize personal settings which can optionally be permanently saved. LikSang has finally cooked up something for all those PC enthusiasts who can't stand using a controller to play console FPSs. Indeed, the SmartJoy FRAG is likely one of the most significant peripherals ever concocted. The device simply allows the standard PS2 keyboard/mouse unit to be used for FPSs, and is even compatible with the Xbox! On top of this, it comes with presets for a number of topnotch titles. And if that's not good enough, it's completely customizable and features inverted mouselook and Deadzone adjustments. 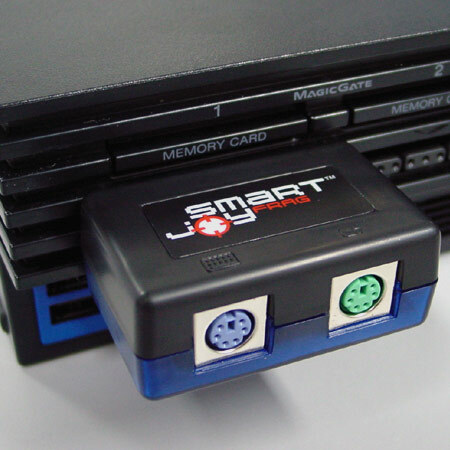 I look into both SmartJoy Frag adapters, starting with the PS2 console. Scroll further down to read about the XBox SmartJoy Frag. Each console has a selection of games that really benefit with this adapter. The SmartJoy Frag is very compact and plugs directly in the Fat PS2 controller port. There is enough clearance for a regular PS2 controller to be plugged in port two. Even the Memory cards can still fit. 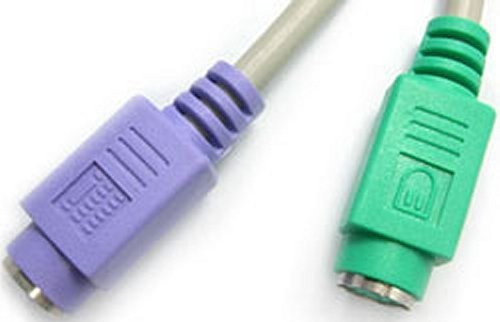 For the Slim PS2, controller extension cables are needed due to the closer proximity of the controller ports. 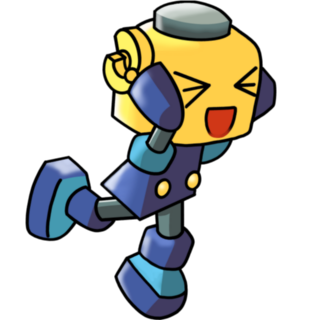 The controller extension would also be needed if using a second SmartJoy Frag for player 2. The mouse will default to the RIGHT analog stick. 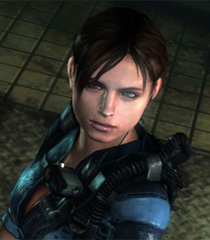 Unless an FPS, most games use the LEFT Analog stick as the main control. You will have to reprogram to set the ball tracking to the LEFT analog stick. Note that a majority of USB controllers will not work, even with a PS/2 PC adater. However, any PC PS/2 Mouse, Keyboard and Trakball are all plug in ready. Purple for Keyboard and Green for Mouse or Trakball. Note that a selected preset will work with any game that has a similar control layout. REZ in particular swaps the mouse over to the left stick which opens up a whole world of possibilities! REZ is beautiful with a Mouse or Trackball, I can actually hit the enemies with precise controlled accuracy! Any game that uses the left or right Analog Stick or Direction Pad for movement can now be played with a Mouse! The sensitivity can also be set. None of the presets are arranged for Mame default Fire buttons of CTRL, ALT, SPACE, LEFT SHIFT and the Z and X keys. Not a big deal, utilizing the ESC key and the included chart allows for custom settings that can be saved. An easy swap of keyboard and button assignments. My only disappointment is that some USB adapted controllers will not work. Macally Trackball and most USB mice will not work. However, the Microsoft Optical USB Mouse works just fine with a PS/2 adapter. Of course any PC PS/2 (Not Sony) connector Keyboard, Mouse and Trackball also work great. Though not rare, a PC PS/2 direct connector optical mouse is not common, will be hard to find in the future. A PC PS/2 connector Trakball is even a tougher one to spot. Definitely grab any that are spotted at the Thrift Store or Swap Meet! Note that all PS/2 and a few USB devices work without performing this mod. This modification to the SmartJoy Frag removes an internal transistor, giving full voltage to allow more USB controllers to be recognized. It is a very simple mod, but I don't want to risk frying my rare Macally Trackball or my Custom Spinner Mod pictured below. If someone having power-issues with the SmartJoy-FRAG (PS2), there is a easier and simpler way then splicing cables !!! Open the SMARTJOY FRAG, you should see two transistor like looking black-things on the left and right side (LM-78L05). These are the voltage converter to lower from 9V to 5V, they need a minimum of 7V to proper output 5V. if they only get a 5V-input they will not work right, or at all. AFTER THIS MODIFICATION DO NOT USE THE SMARTJOY FRAG ON THE PLAYSTATION ANYMORE, IT WILL DAMAGE YOUR CONNECTED MOUSE & KEYBOARD. Remove the regulator by cutting the middle leg as short as possible but keep the outer legs longer so you can bend them together ( don't just twist them together, solder them ). Mod only if you need that certain USB controller to work. All PS/2 controllers work just fine with an unmodded SmartJoy Frag. The mod change in supply voltages to power adapted devices really concern me. By cutting the Transistor out of the loop, any normally Five volt Mouse or Trackball plugged in will get seven Volts from the PS2 and Nine Volts from the PS1. Even without the mod, there are different controller supply voltages in the PS1 versus the PS2; this unmodded adaptor will only be used on a PS2. Pin 1 - Data/Signal transfer from Controller to PSX, this signal is an 8 bit serial transmission synchronous to the falling edge of clock. Pin 2 - Command, is the counter part of DATA. It is again an 8 bit serial transmission on the falling edge of clock. Pin 5 - VCC, this can vary from 5V down to 3V and the official SONY Controllers will still operate. Pin 6 - Used to get the attention of the controller, this signal will go low for the duration of a transmission. Pin 7 - Clock, is used to keep units in sync. Pin 8 - is not connected or N/C. Pin 9 - ACK, is acknowledge signal from Controller to PSX. Unfortunately some USB adapted Mice and Trackballs will not work and the mod links above are too risky. However, a Standard Microsoft USB sensor Mouse works fine with the green PS/2 USB adapter. There might be other USB Mice and Trakballs that would work, my guess would be models that require lower milliamps. Imagine playing games on the PS2 with a Mouse or Trackball. Add in my Spinner Mod and then enjoy the games just like they were meant to be played! Here is a list of a few I can think of. The fun is playing these and discovering others! Note that I have Asteroids listed, control the ship like Spinner Control Omega Race or button key control as in the Asteroids Arcade Panel. Simply press one of the Function Keys after your game boots up. Note that a selected preset will work with any game that has a similar control layout. Strange that Panzer Dragoon Orta was not one of the preselects as in REZ on the PS2 SmartJoy Frag. Also an on the rails shooter, It really needs a Mouse or Trakball to control the gunsight. You can easily reassign the controller buttons including the triggers as well. 1. Hold ESC key on keyboard. 2. Tap the original key on the keyboard that matches the Xbox button. 3. Click the Mouse or Trakball button. For example; Hold ESC, tap SPACE (Xbox A button), Click Mouse/Trakball Button, release ESC. Press ESC CTRL ALT and DEL keys to restore the SmartJoy Frag Factory settings. The games I listed for the PS2 above gives an idea the game genre that also can work on the Xbox console. I have found the best Trakball is one that does not use rollers, but a sensor inside. The Logitech Marble Mouse really works well for quick accuracy. CRTGAMER wrote: The best Trakball to use with a SmartJoy Frag is the TrackMan Marble FX 804272-1000. The huge ball is close to regulation sized Arcade Trakballs and it comes with a PS/2 connector, perfect for the SmartJoy Frag. Games such as Tempest, REZ and Panzer Dragoon Orta are an absolute dream to play with the quick accuracy of the Trakball. I love the Logitech Marble it uses a sensor just like a sensor mouse, no rollers that could skip. 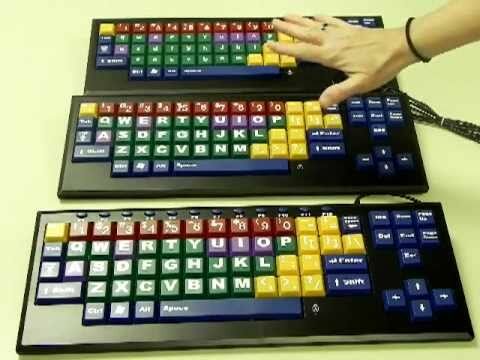 I found the best keyboard to use for Arcade style game play is of all things is a kids keyboard. The My Board III built by Chester Creek also has a PS/2 connector and has ridiculously huge keys. This simulates Arcade button control games. There are no Function Keys on the kids keyboard, but an easy swap of button assignment using the ESC programming key. The big keys on the keyboard actually work well as "Arcade Buttons" simulating the Arcade button control for games such as Asteroids. A very nice tactical click of the large keys. 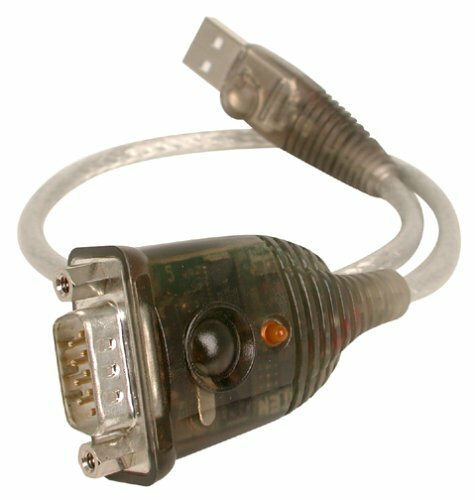 The adapter is designed for Serial Modem connections thru USB, Thanks to Google Images to help me identify who made this. I downloaded and backed up the drivers for both PC and Mac. Pleased to now have the capabilities of my Kenningston Expert Mouse Trakball working thru USB! 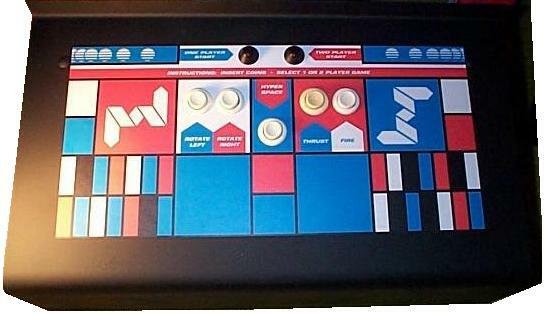 A perfect Trakball for Mame games. The ball is a standard regulation Billiard Ball size, easily drops out to fit the Inland Pro Track housing. I was going to order a spare Cue, instead placed an order thru Amazon for an 8 Ball in the corner pocket. There is also XMouse which adds button programming. The sturdy design (including heavy steel backplates and a strong plastic frame) of the keyboard allows even the most abused to survive for years. The various models of the keyboard had small differences, while keeping the style of the key mechanism that makes the boards unique. The Buckling spring design gives the keyboard a unique feel and sound. Unlike the common (and cheaper) dome switch design, the Model M’s buckling spring design gives users obvious tactile (a distinctive resistance as the keys are depressed) and aural (a characteristic, loud "click-clack") feedback. Many users report that they can type faster and more accurately on the Model M than other keyboards. A tiny bit of 3in1 Oil works well to loosen the Trakball rollers and pads. Get your SmartJoy Frag here! The Smart Joy Frag is longer made. Last edited by CRTGAMER on Mon Aug 28, 2017 10:28 pm, edited 82 times in total. I read that the cables are needed so the memory card would clear or was it the PS2 Slim molding interferes with the Smart Joy Frag? There is a sale link above. This is a great thread! I'm assuming there's not many comments because there isn't much to say. You're breaking new ground here as far as I know. I really only tried a few FPS games on PS2 with mine and found it to be a little constrictive on some games due to the limitations of analog stick controls vs what it can do to make the mouse respond to those limitations. I then proceeded to plug it into my PC to do the usual tests I do with all my controllers. Mario was a fun challenge with it but the game's not meant to be played with a mouse. Tetris fared a bit better but still wasn't quite right. I should be thanking you because my appraisal of the adapter was "huh... this needs more investigation to be fully appreciated" and I put it back in the plastic with it's documentation until I could think of a useful application for it. I meant to answer your questions in the other thread but I've got a lot of projects on the go right now so I never got around to trying Policenauts with it. I'll scan the documentation and packaging that came with it shortly and link to it here. I'd like to see what else you can come up with to use it with and look forward to the results of your modding experiment. While I was reading this post yesterday one of my friends was reading over my shoulder and commented on the voltage issue saying that most electronics can run on various different voltages in his experience but it's the amperage you have to worry about. He says a few extra volts in any direction should be fine but the amps can blow stuff out if they're too far out for the hardware's resistance. He continued to mention that the first thing he'd do is take a ammeter to the 2 consoles to see what they're pushing on the main power pins and go from there. If you do that and post your findings I'll ask him to take a look at it, and I'll bet he can figure out what might be soldered in place of the transistor to make it safe for your USB hardware. We might even take mine apart and play with it using his hardware lab where I do some testing of my mods when I'm lacking the proper testing equipment or parts. To anyone who's interested in this stuff and hasn't bought one yet I'll agree with CRTGAMER's query about it no longer being produced by mentioning that no other online store has carried it for several years now (I looked these up a long time ago). My guess is that these will be gone soon, and at the price Rich is selling them at you'd be wise to buy him out and hold on to them for a few years. I'm gonna buy another right now. I think I'll try to incorporate into my in-planning bartop mame cabinet. Anapan wrote: While I was reading this post yesterday one of my friends was reading over my shoulder and commented on the voltage issue saying that most electronics can run on various different voltages in his experience but it's the amperage you have to worry about. He says a few extra volts in any direction should be fine but the amps can blow stuff out if they're too far out for the hardware's resistance. He continued to mention that the first thing he'd do is take a ammeter to the 2 consoles to see what they're pushing on the main power pins and go from there. I am tempted to pick up a second Frag unit and perform the Mod. Agree it is the Amps that will kill the electronics. The Frag box has been proven to work with the Mod and various USB devices connected. But I really would hate the risk of damaging my Spinner Mod or the rare Macally Trakball. The unmodded Frag does light up a Dell Sensor mouse, but the mouse does not on PS2 games. A Microsoft USB Sensor mouse does work fine, maybe not needing as much amps. Perhaps a replacement Transistor that would allow just slightly more voltage, say 5.5v instead of the full 7 or 9 volts? Maybe your electronics friend might find the right transistor specs replacement? In the mean time I do have a PC PS/2 (Not Sony) Logitech Trakball as well as the Microsoft USB mouse that works. Luckily my Spinner Mod also has the standard PC PS2 (again not Sony) connection. I went that route for 100% compatibility for all DOS, Linux, Mac and Windows Emulators. Last edited by CRTGAMER on Mon May 20, 2013 7:15 pm, edited 1 time in total. When my second SJ-Frag comes in I'll pull it part at my friends house, try to enhance the mod you posted about with a pile of USB peripherals and PS/2 adapters and post my findings. Between the two of us we have lots of expendable fodder material. He's got many boxes full of various labeled resistors, capacitors and transistors. He'll know what to do. and I bought it all! There you have it - he's got the last of the stock. Anapan wrote: There you have it - he's got the last of the stock. i believe my birthday comes first bro..
are you also a Taurus?